One of the most common EMC test types is the radiated emissions test. Radiated emissions testing is the measurement of the electromagnetic field of the emissions that are unintentionally being generated by the equipment under test. 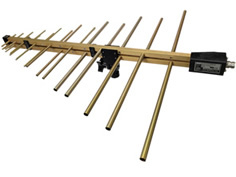 To cover the entire frequency range of interest, several different antennas may be required. Radiated emissions field strength values are measured as follows. Place the antenna at the proper distance from the source of the emissions, or the equipment under test. Typically this distance would be a 3, 10 or 30 meter separation depending on the test standard. Position the antenna at the product being tested. This includes bore-site direction, and polarization (polarity). Connect the output of the receiving antenna to the input of the receiving system (spectrum analyzer used to measure field), using a low VSWR, low loss coaxial cable. The input impedance for the receiving system, and the receiving antenna should all be matched to 50W. Most antennas are already matched to this impedance, if they are EMI/EMC antennas, as should most receiving systems. If this is not the case, the readings will require correction for the impedance mismatch. Select the frequency of interest on the receiving system. Ensure that the receiving antenna is capable of providing accurate measurements at that frequency. This includes ensuring the antenna can receive a signal at the frequency of interest by its designed frequency range, provided by the manufacturer, and that the antenna is properly calibrated at that frequency. Measure the RF Voltage, Va, referenced to the receiving system. The units should be in decibels referenced to 1 micro-volt, dBmV. If the units are in absolute micro-volts (dependent on the receiving system used) they should be converted. 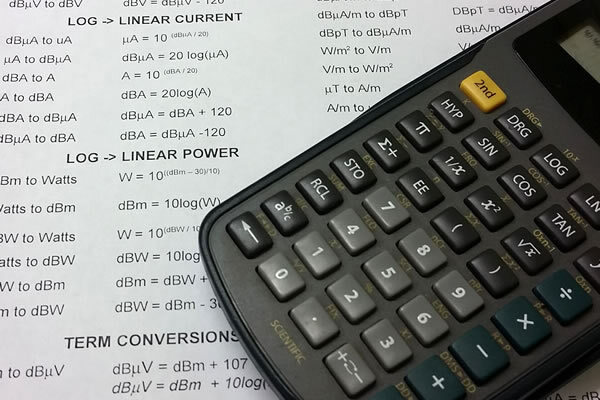 The conversion factors are as follows, however, more information about the conversion (and other useful formulas for RF related conversions) can be found in the RF conversion technical note. Once the reading is converted to dB micro-volts (dBmV), it can be added to the antenna factor to determine field strength. The antenna factor is provided with an antenna when it is calibrated or newly purchased. If the antenna factor for an antenna is not known, typical values can be used to approximate field strength, in development, however, this is not acceptable for formal compliance testing.